Update! If you have an .mp3 player, You can hear my organ! The link is near the bottom. This is a picture of my console. It is a 1928 Wurlitzer Theater Pipe Organ Console. For many years, an accomplished organist used this console to provide music and sound effects to people in theaters who were watching otherwise silent films. Assisted by the genius of Robert Hope-Jones (?-1914 born in England) The Wurlitzer family diverged fairly radically from contemporary pipe organ builders. Consequently, the quality and variety of tones produced is easy to identify when heard. Personally, I love the sound. The Theater Pipe Organ industry was a short lived one. It grew from almost nothing in the 1900's to a peak in 1926, and then quickly faded as the "talkies" made history. By 1935, Most builders were either gone, or diversified into other areas. The Wurlitzers were rather well set to survive the change. 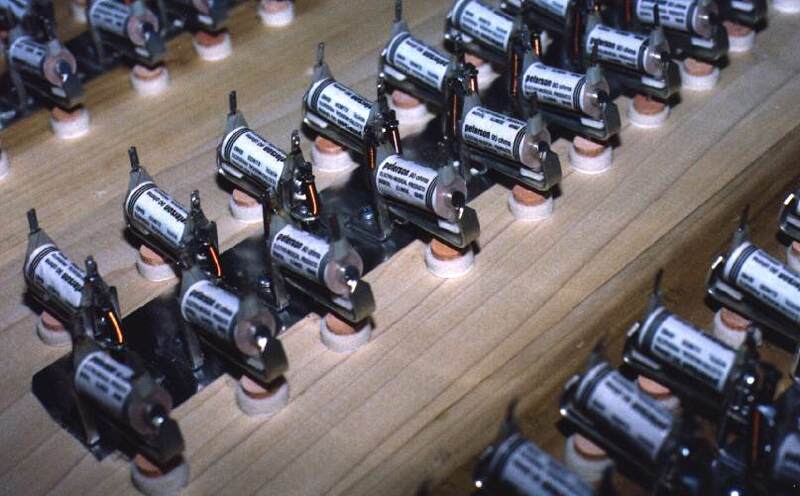 Many of their small pipe organs were designed to be automatic. They played music the same way a player piano did. With music rolls. Very small units even had coin slots. These later became the American cultural icons called "Juke Boxes". They made as much history as did the theater pipe organs they made. 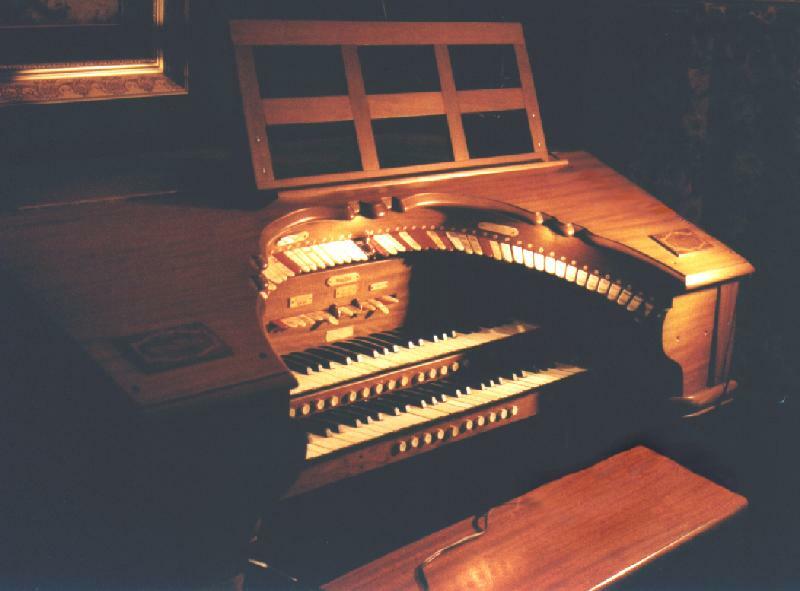 The Wurlitzers were by no means the only builders of Theater Pipe organs. Kimball, like almost all of the other builders, made marvelous instruments. In 1976, I had the opportunity to stand next to the organist as he played the truly massive Kimball installed In the St. Paul, Minnesota public auditorium for the Episcopal Church's General Convention. It sounded glorious. But, like so many others, the instrument does not exist in that state anymore. It was removed with caring hands and the parts went somewhere, but I have no idea where. Here are some pictures of my project so far. Click on them to see larger versions. This is a photo of the underside of the chest toe boards. It shows you the electromagnets that control wind to each pipe. They are shown not yet wired. Here you can see a chest with half of the Vox Humana pipes. I have another chest designed as a mirror image for the other half. 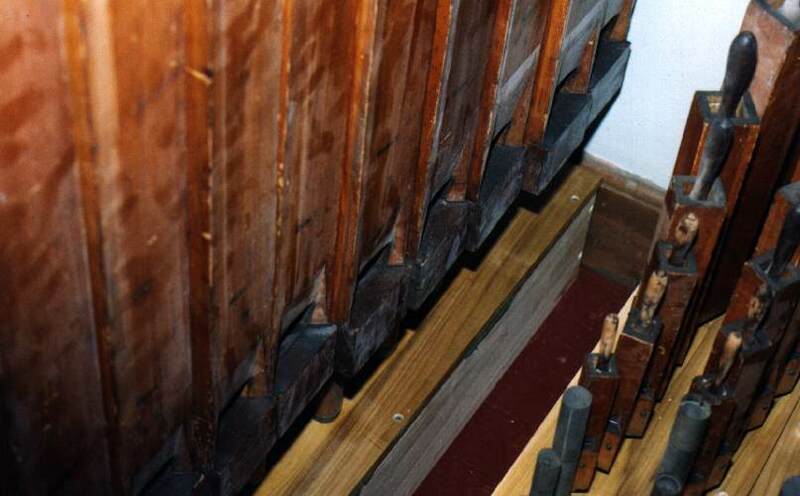 To the right, is a chest which has 9 pipes of the 8' octave of the flute rank. It's called an offset chest. 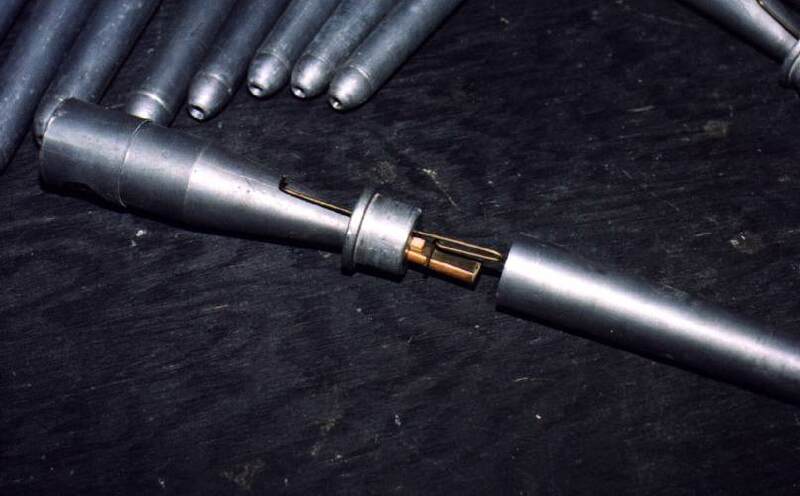 This is a close up of a Vox Humana reed pipe. This is two chests... Left is a flute chest. The metal pipes are treble extensions. The chest on the right has no pipes, or even a rack board. At least you can see the toe holes where the pipes rest. That chest is for the Vox Humana. At last, here's a pic of the chamber. 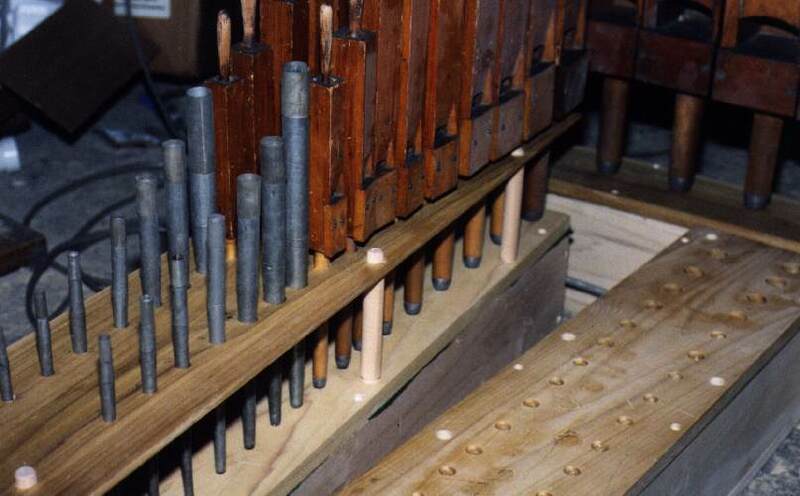 The low 9 notes of the 8' flute octave are on the left, next is the rest of the flute pipes, and far right (just out of view) is the Vox chest. To the right of that,is a wall. Yes, it's a small chamber. I have an 85 note, 16 foot Leiblich Gedeckt, and an 73 note, 8 foot Vox Humana. They are both of lovely tone, and should perform well in the small environment of my home. In other words, they shouldn't blow anyone away. They should end up very nice. HERE some day will be a picture of the blower I am using for this project. It is vintage! It was made in 1914 by the (then) Spencer Turbine Company. The model is an "Orgoblo" It produces lots of wind, at a static pressure of about 6 & 1/2 inches of water column. More than I need. I expect I'll use 3 & 1/4 or 3 & 1/2 inches. 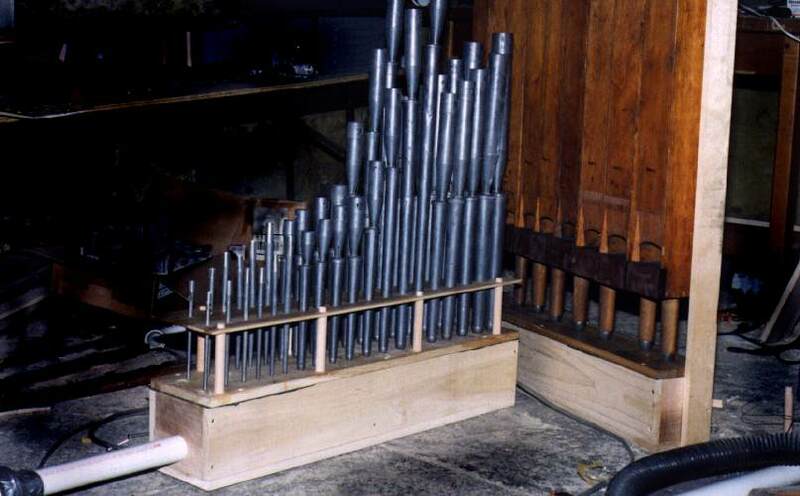 Here's a weird fact: This very blower powered an organ that was in a church that my parents attended. The church was torn down before I was born. That this blower ended up in my hands, is remarkable. It needs to be cleaned. I expect that will be a major project. Perhaps I will have photos of the procedure. I am still trying to figure out just where in my house these pipes will go. The largest is almost nine feet tall, and will have to be mitered to fit the ceilings. The smallest pipe I have so far is about 3/4 of an inch long from mouth to top. It makes a very high pitch tone. Update: The flute rank is playing! I had to order new springs from the reservoir, to bring the pressure up to four inches. The treble pipes were just a bit flat at 3 & 1/2 inches. I couldn't tune them, even with opening up the toe holes. Now, it's just fine. Organ building is one of the last hand-ear-eye skill professions left in which almost all of the knowledge in a builder's head is passed directly from another builder. This has led to very few people knowing the art fully. I would like to change that. If more bright, inventive, creative people were involved, the world might be blessed with another Wurlitzer, or Skinner. Or even far surpass them. It is possible. This page was created November 15, 1997. and is © ARM.